Wonder Woman (2017) is coming to the silver screen this June. After all these decades, Wonder Woman's origin story finally will be theatrically told. Gal Gadot is tackling the challenge and already appeared in the epically divisive Batman Vs Superman, where at least to me, she stole all her scenes whenever she briefly appeared. Do you think that Warner Brothers and DC can pull out of this seemingly inevitable plane crash (two critical failures in a row: Suicide Squad and Batman Vs Superman)? Are you super excited? Mildly amused? Super apathetic to this summertime blockbuster female-led superhero film? I hope they do a good job with it, but I think there's a higher probability they will F it up. Will be good. Better than last SM v BM but not as good as dark knight. This is what I'm expecting/hoping for at least. Yes, it'll be easy to beat SM v BM but very hard to beat Dark Knight, so it has a good chance of being in between these two. (one bar is on the ground and the other is in the stratosphere, so lots of space in between). I saw that number. Very encouraging. Might even be worth a trip to the theater. Has anyone else here seen it already? Saw it, loved it, plan to watch again. I went to a dingy little cinema tonight to see the 9:30 showing and it was almost packed. It was their largest theater, too. I've been to shows when I was the only one there. Pretty good movie. I think every teen/tween girl in the US is going to be getting a Wonder Woman scarf this Christmas. Various WW scarf/shawl knitting patterns are everywhere in the knitting groups I'm in. Some people report seeing the movie many times because their kids (boys and girls) love it so much. Almost in Disney love territory. It's a kickass movie that doesn't deserve the vitriolic, misogynist tsunami of hate. 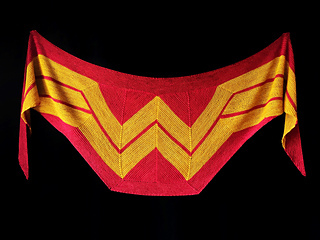 You got any pictures of a finished Wonder Woman scarf? can you see any of the pix at this link? 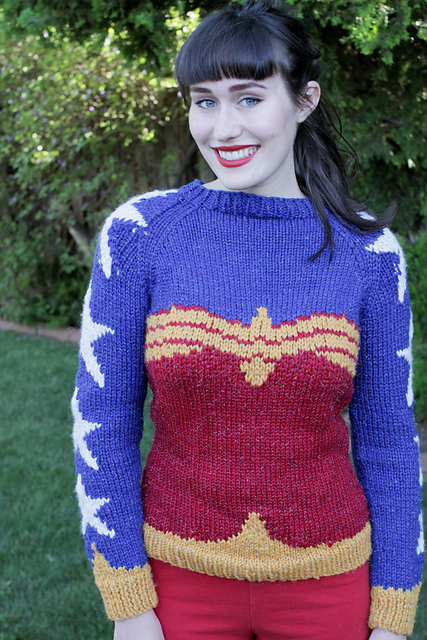 a whole page of patterns/projects at Ravelry ! » Wondering How Good Wonder Woman is Going to Be?